Steele, who starred for Seattle’s Bishop Blanchet, was one of the mostly touted prep players in state history. 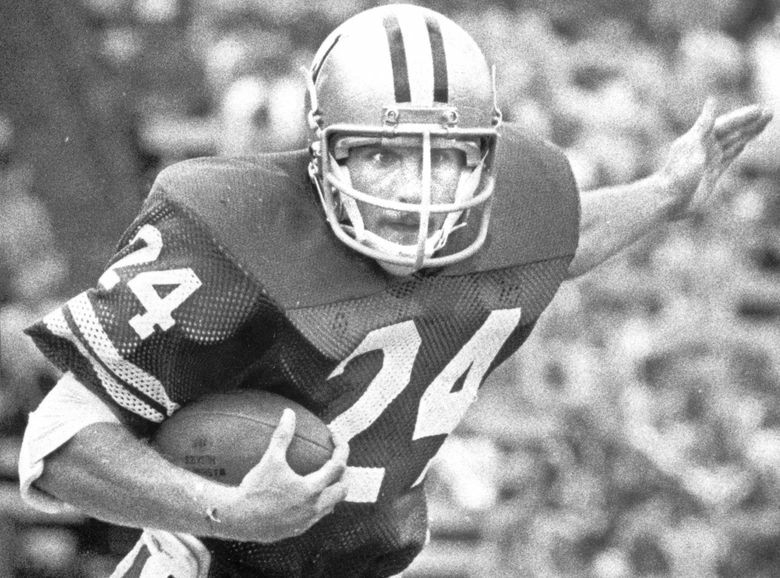 Don James, in his first season with UW in 1975, needed to land a recruit like Steele. If he did, other local stars would certainly follow. Joe Steele had just come back from an exhausting recruiting visit to Nebraska, and he decided to cancel his upcoming visit to Notre Dame. The 6-foot-4 running back with a great combination of speed and power was going to be a Husky. That decision more than four decades ago did not get one-hundredth of the fanfare that it would today. But it might have been the most important commitment Don James got during his highly successful tenure as Washington’s coach (1975-92). Steele, who starred for Seattle’s Bishop Blanchet, was one of the mostly touted prep players in state history. James, in his first season with UW in 1975 while Steele was a senior at Blanchet, needed to land a recruit such as Steele. If he did, other local stars would certainly follow. “I was a local kid; Blanchet is 3½ miles from the University of Washington,” said Steele, who had seven brothers and sisters and whose father was an FBI agent. “Great city and great university; I was not interested in picking up and moving across country. So was Steele. In 2004, he was voted the state’s best high-school running back in a poll conducted by The Seattle Times. He lived up to the hype as a Husky, breaking nearly every rushing record at UW over the next four seasons and helping Washington to a 27-20 win over Michigan in the 1978 Rose Bowl. For Steele, the storybook football career essentially ended when he suffered a severe knee injury late in his senior season. But his legacy was secure. Steele rushed for 3,814 yards and 44 touchdowns in high school. Fans filled Memorial Stadium to watch Blanchet and its big star. Steele seldom disappointed. The 1975 Metro League championship is often called the greatest game in state history. Almost 13,000 fans crowded into Memorial Stadium to see Blanchet and Garfield, both 8-0, face off. The game was not decided until the fourth overtime, with Blanchet scoring the winning touchdown on a halfback pass from Steele. Steele was just as successful at UW. After rushing for 421 yards as a reserve as a freshman, he played a huge part in leading the Huskies to the 1978 Rose Bowl, rushing for 865 yards and scoring 14 touchdowns. He had a team-high 77 rushing yards on 13 carries in the Rose Bowl win over Michigan. “The city of Seattle became Husky fans again, and I am really proud to be a part of that,” Steele said. As a junior, Steele rushed for 1,111 yards, breaking Hugh McElhenny’s UW season record set in 1950. He got the record in the season finale against Washington State, rushing for a career-best 193 yards that day. He left the game early in the fourth quarter in UW’s 38-8 win, but James got word that Steele was 25 yards short of McElhenny’s record. James sent Steele back into the game. It was a 28-yard touchdown, his final carry of the season. Steele was having a big senior season when the Huskies were playing UCLA in the eighth game of the season. Then came the devastating play that ended his year, and essentially his career. His job was to fake like he was running the ball on a wide receiver reverse. Steele’s ACL, posterior ligament and lateral ligament were torn. He had surgery the next morning. Despite missing the final few games, he was named all-Pac-8, with 694 yards rushing and 12 touchdowns. His 3,091 career rushing yards was a UW record for 15 years until Napoleon Kaufman broke it in 1994. Steele still ranks fifth all time. In the spring of 1980, Steele was drafted in the fifth round by the Seattle Seahawks. Steele played in exhibition games but was released in the final cut. “They just felt like I wasn’t going to be back,” Steele said. Steele went back to UW to finish his degree in political science, then signed with the Edmonton Eskimos, where his former teammate, quarterback Warren Moon, was playing. Jackson is convinced that Steele would have had a nice career in the NFL had it not been for the injury. “Without a doubt,” Jackson said. Steele, a longtime UW football season-ticket holder, transitioned into the business world, working the last four decades in the commercial real estate business. He is a senior vice president for CBRE, supporting corporate clients with their portfolios. Joe and wife Lisa met at Blanchet and have been married for 31 years. They have two children: daughter Kaylen, 29, graduated from UW and works for Nordstrom, and son Jake, 20, is a junior at UW in the business school. And what would have happened had he not been injured so severely? It is a question that has long been pondered by others but not him.